Lock in a great price for Isara Beach Home – rated 8.6 by recent guests! Sea view was great, lovely balcony, tasty smoothie in the breakfast, wifi was ok. Owners are very kind people. Nice and helpful host family. Right on a nice beach. Quiet although on the road. The Beach Home was amazing, the best part is having the room with Sea View. The bed is very comfortable & the bathroom is clean, you have a nice kitchenette, and the family is very friendly and The ownder helped and supported me throughout my trip. I've stayed with this family three times now. In the five years I have lived in Asia, this is by far the best value for your money and time. Iroshan and his family are so amazing, friendly, helpful, kind. The property is a loft set above the family home. It has a back and front entrance, one way right down to the beach. There is a nice, balcony, kitchen area and the quiet beach is right there. It feels like an apartment/ home...I could live here. They also have their family restaurant right next door with great food, seafood. The area is quiet and only 8km from Galle, so nice to relax and retreat. The family is wonderful! I've established a great relationship with them. Isara who the home is named after is a pen-pal with one of my friends' kids back in the States. Great location and best value for your money. Breakfast on the beach each morning is wonderful! Fresh baked bread, coconut sambal, string hoppers. The view from the front bedroom is incredible. The family is lovely and makes you feel completely comfortable. I would highly recommend this place as a hidden gem in the Galle area. Who doesn't want to wake up to the sound of crashing waves outside your window. Isara Beach Home is located outside of Galle. It's directly at the beach und from the room and the balcony you can see the ocean. It's a private beach without a lot of people. It's the perfect place if you're looking for some privacy. There are bars and restaurants nearby where you can eat and drink. The owner is a very welcoming and kind guy and also very creative. He fulfilled our wishes for breakfast and arranged a transport to Galle for us. This is the second time I have stayed with this family. They are extremely friendly, hospitable and helpful. The loft room has a shaded, outside balcony, a kitchen and a front and back entrance. It is right on a quiet and clean section of beach, elevated on the second floor. You literally just have to walk down the stairs to go for a swim. They also have a beautiful, outdoor restaurant right next door where you can eat the complimentary breakfast or enjoy a great dinner. The facilities are comfortable and clean also, even extra touches like an outside shower and small, enclosed area with chairs to watch the sunset and the fishermen going out to sea. I have established a strong relationship with the whole family, even corresponding with Isara, the 5 year old girl whom the place is named after. She is an amazing artist. I have lived in Asia for some 4 years and this is one of the best accommodations I have stayed at. So good!!! It was a really nice stay with a super helpful host. We would recommend to stay there instead of Galle City as the beach is not crowded at all with relaxed bars and you ge to Galle in 10min by TukTuk. 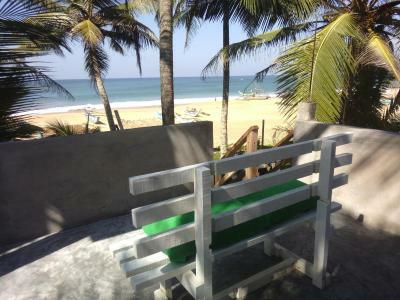 Offering a private beach area, Isara Beach Home is set in Pitiwella in the Galle District Region, 6.8 mi from Hikkaduwa. Guests can enjoy the on-site bar. Free WiFi is offered throughout the property and free private parking is available on site. The area is popular for sea turtle sightings. Car hire is available at this bed and breakfast and the area is popular for diving. Bentota is 27 mi from Isara Beach Home, while Galle is 4.3 mi from the property. When would you like to stay at Isara Beach Home? Specially set up on customer privacy based with amazing ocean view. and this beach is most famous for sea turtle sight seen. House Rules Isara Beach Home takes special requests – add in the next step! Very small bathroom, shower pressure low. Dead cockroach under the bed. Owners need to invest in the property, outdated. Traffic noise day and night. It's a bit out of the way of the fort or any good eateries. But, that's also part of its charm. Cannot swim from the homestay as there was no beach. We expected two separate beds but got one - I guess that was in the other room which I just realized the next day that exists at all. :) A bit old style. Beach view, nice host, clean. A bit far from Galle but easy access to local buses to get there. Its a little far from the city and you need to take a ride for 30 mins.